As usual, this should be my last post for the month before our big day! We will be having our 过大礼 (Guo Da Li - GDL) next week and it will be ten ten ten ten before we know it. You can read more about how we manage our finances here. 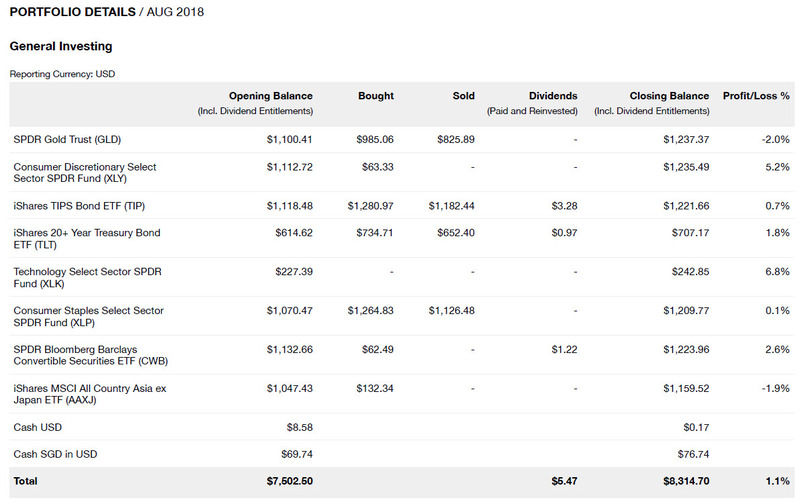 Removing our shared expenses which come out of our mutual fund (KPO Expense Fund), my expenses for August would be $3,008.64 - ($1,757.26 / 2) = $2,130.01. Banquet - We started making monthly installment payments to the hotel in order to avoid the lump sum pain. GDL - Bought some cakes from Pine Garden. To be exact, 25 boxes of cakes -.-" The most ridiculous part apart from spending hundreds on cakes is that the bride (CZM) is not allowed to eat any of the cakes although she was choosing what she wanted to eat. LOL. Photography - To save some money, we decided to make our own photo album and 3 12x12" Canvas through Photobook. It was supposed to be cheap until we realized that you cannot ship them in 1 order and had to pay $40+ for shipping. I got to say there are lots of hidden costs. Having said that, it is still slightly cheaper than the others. Grooming and Others - CZM bought some hair accessory, decorations and suspenders from Carousell. I previously blogged about my promotion and increment - Salary - You Are Your Best Investment and it was only effective from February so I gave my parents more allowance as well. This is a fixed monthly cost for the basic coverage - term life and hospitalization. Attended a wedding at Crowne Plaza Changi. My food expenses are exceptionally low because I stay with my parents! Most of it is incurred when I am out with CZM. In addition, half the month we were in New Zealand and the food expenses were paid by the family mutual fund. I would always pay for CZM's cab ride home during night time since I am too lazy to send her home. That was one of our agreement. lol. 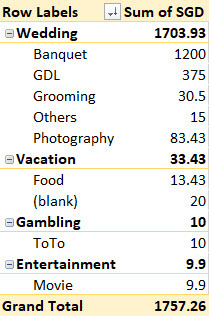 EZ Link expenses were much higher this month which was probably due to the wedding preparation, hence we have been commuting a lot more apart from work. 1. I am no longer using EZ Link Auto-Reload. Account-Based Ticketing (ABT) is a much better choice as you pay what you use instead of triggering top up where the money is stored in the EZ Link card. The best part is miles can be earned too (using UOB PRVI Mastercard)! 2. $0.50 Discount for commuters who enter stations before 7.45am on weekdays. The $69.97 is the installment for Surface Pro which I got about 2 years back. If you are an existing shareholder, you should be aware of the proposed acquisition of the office components of OUE Downtown. You might be aware that I actually do like rights issue as they present an opportunity to accumulate more shares at a lower price. 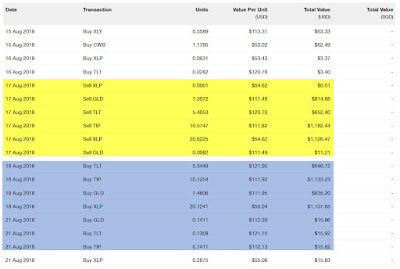 However, I have sold all my OUE Commercial REIT today (8,000 units @ $0.605) and these are the reasons why I will not be participating this extremely bad deal (at least for my case). My average price was $0.70 and before the rights issue, the yield on cost was around 6.67% and with a NAV of $0.91, it was trading at >20% discount. However, after the rights issue, even with a huge oversubscription, I can no longer get back the same yield. Besides not being yield accretive, this proposed acquisition/rights issue reduces the NAV significantly! 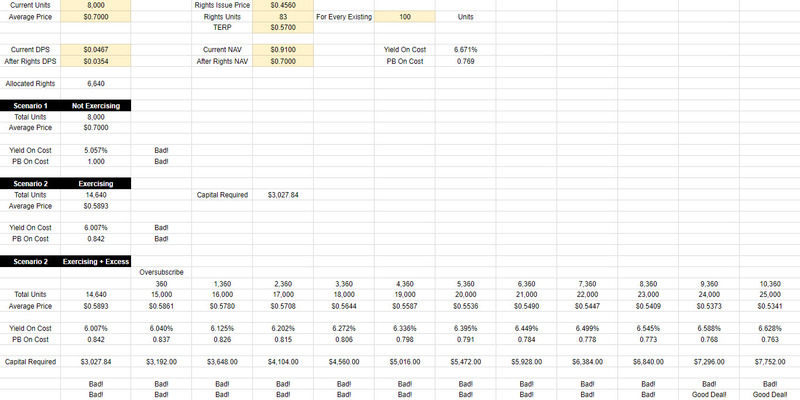 You can use my google spreadsheet/calculator to see how would this rights issue work out for you - KPO Rights Issue Calculator. Just fill in those in yellow and the rest are formula-linked. 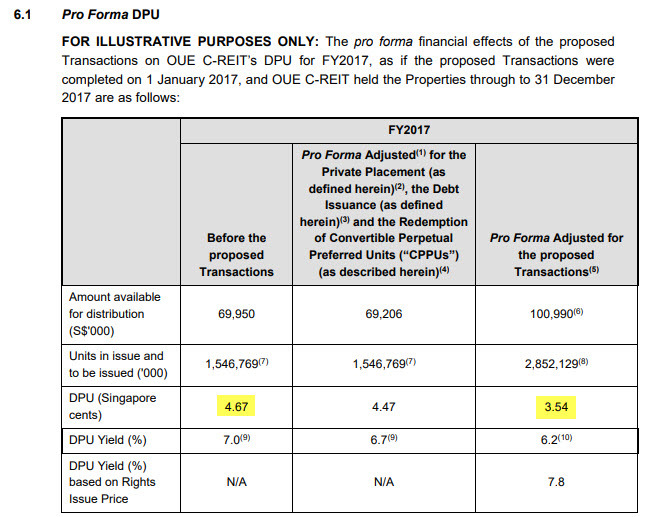 OUE Commercial REIT IPO in 2014 and based on historical data since then, it has been trading at mean/median PB of 0.78/0.75 and mean/median dividend yield of 6.48%/6.59%. What does that mean? After the rights issue, with a lower NAV and lower DPU, the price will have to fall further in order for it to reach its mean/median PB and dividend yield. 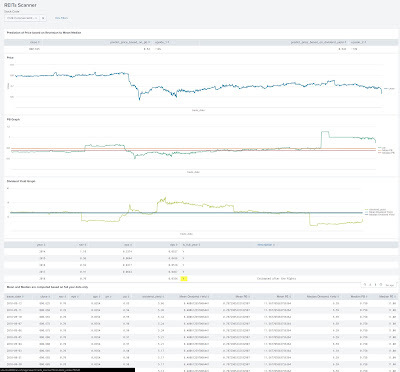 My REIT Scanner is predicting $0.54 which is lower than the TERP of $0.57. 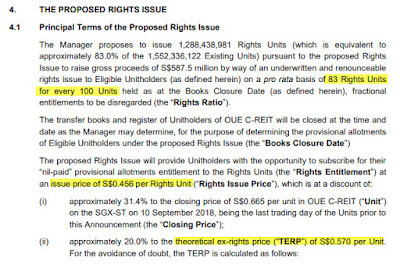 Before the rights issue was announced, it was still trading at around $0.68 and with a NAV of $0.91, the PB would be around 0.747. Take this PB and multiply by the new NAV of $0.70 and we will arrive at the estimated price of $0.523. 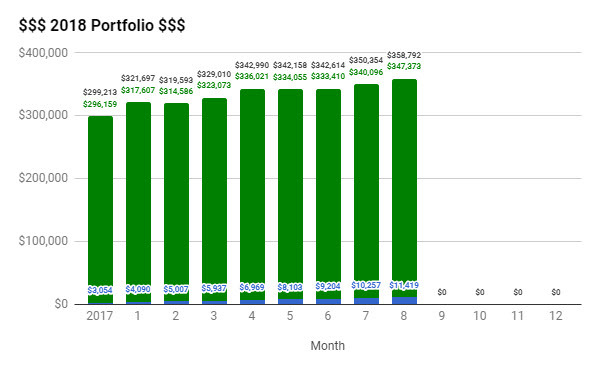 On the bright side, after holding it for ~1,200 days (> 3 years) and including all the dividends collected over the years, the total return is 8.5% and the annualized return is 2.9%. Should have just top up this amount to CPF SA 3 years ago instead. Good luck to the existing shareholders! Those that are planning to enter, my advise is to avoid it first and wait till it falls further. This rights issue is not attractive at all. Do not make the same mistake as I did previously - Mistake on Rights Issue - CapitaLand Commercial Trust. StashAway introduced 3 new portfolios last month and Financial Horse has done an excellent write up on it - The Weekly Horse: Review of StashAway’s new “High Risk” Portfolio. Do read it if you have not as it is definitely interesting enough for Michele, the CEO of StashAway to leave his comment. Due to the introduction of the new portfolios, we had some unpleasant experience with StashAway. This would have been a post by itself if we did not go to New Zealand and gotten so busy with our wedding preparations. 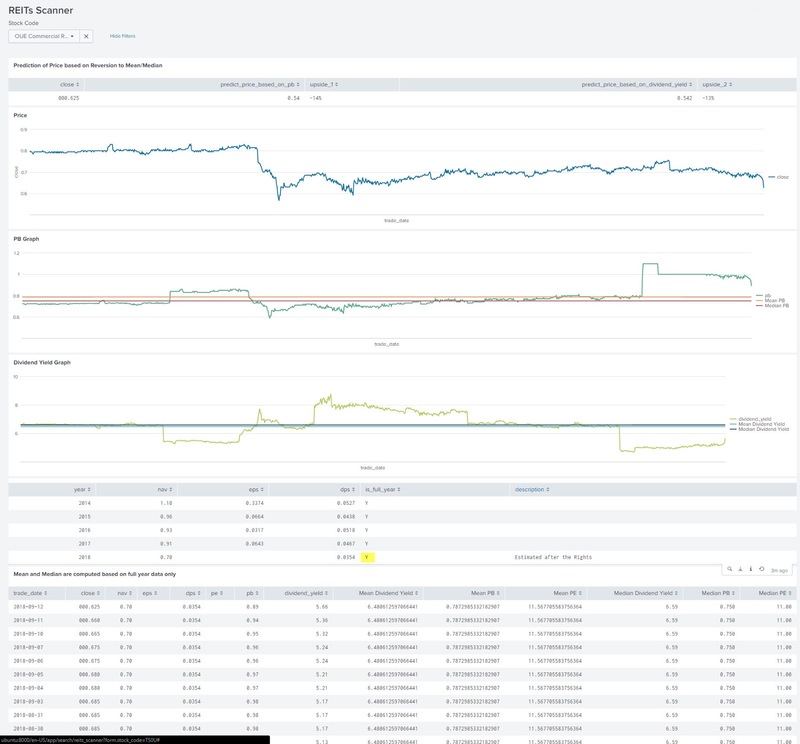 I am willing to take on more risks (stock picking, buy small caps, try out robo, etc.) while CZM is the more conservative one (STI ETF and blue chips). When I knew StashAway was introducing higher risk portfolios, I was pretty excited as I felt that the previous highest risk portfolio, P28 was still very conservative. Meanwhile, I was emailing StashAway to understand what exactly was going on. In short, the orders are consolidated only once at 6pm and there is no internal netting of orders if you are wondering. As usual, there is nothing to hide so you can read the whole email thread hosted here, word for word except for their emails and contact numbers which have been masked. Having said that, it takes two hands to clap. I am at fault for not confirming with CZM first but it also shows the limitation of their system. In addition, given the limitation of the systems to consolidate orders only once at 6pm, such email communication should not have been sent out at 5:30pm. This would not have happened if it was communicated early in the day, after 6pm or even during the weekends. Hopefully, you guys will learn from my mistake and not have to suffer :) Alright. Enough ranting, back to the monthly update! 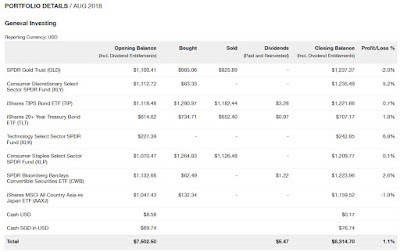 Based on the statement (31 August 2018), we gain $370.75. As of 10 September 2018, we gain $34.81 from investment returns with a huge currency impact of $302.34. Not good! In our last monthly update, I said that I would have preferred the USD to be weaker because we will be going to the US for our honeymoon. Weaker USD meant that we can convert the same SGD for more USD to invest too. I blogged about how the $5 fee credit in StashAway - April 2018. I was charged management fee despite having the referral waiver and was given this credit in return for their mistake. 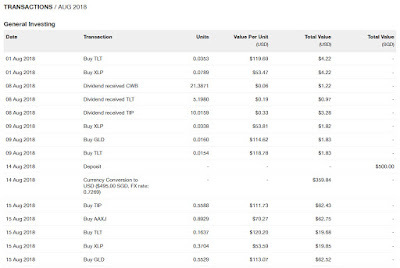 This month commentary: StashAway is the only one making money with an XIRR of 5.34%! One year later, we finally see StashAway's fees > SCB Priority Online Trading commissions. 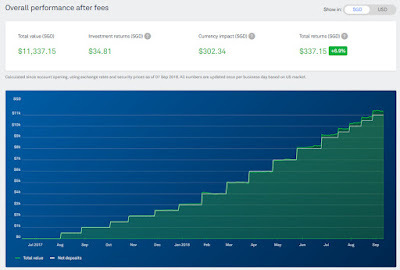 The difference will only continue to get bigger and if such performance can continue, we certainly would not mind paying more fees for a higher return. Like I mentioned previously, those that are already doing DCA on STI ETF, do not be disheartened and stop your investment. Try as much as possible to stick to your plan and in the long run, it will turn out well. 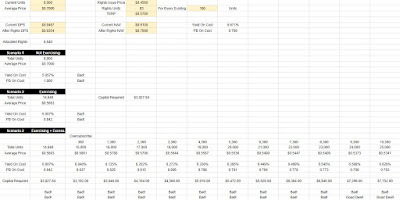 After doing a 2018 Mid Year Review, I decided to make some changes to my spreadsheet to track/include investment into StashAway too. The one in blue is the StashAway portfolio, green is SGX and the total is in black. Our portfolio increase by 2.41% to $358,792 - $12,315.89 of capital injection and -$3,877.44 of capital loss. If you prefer to look at numbers, this is the raw data used to generate the above bar graph. I blogged about Capitaland - An Undervalued Blue Chip? and the price has gone up quite a bit since then. 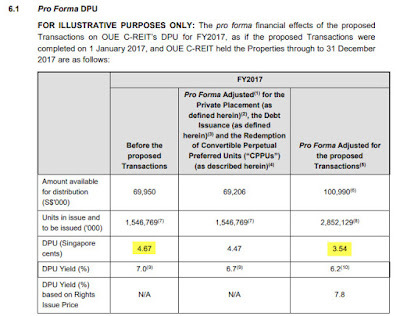 With Capitaland being the 2nd largest investment in our portfolio, we were looking at other opportunities and decided to buy some CDL. The interesting thing about CDL is that its properties are stated at cost while the others/majority of the developers state them based on the fair value determined by internal valuation or independent professional valuation. 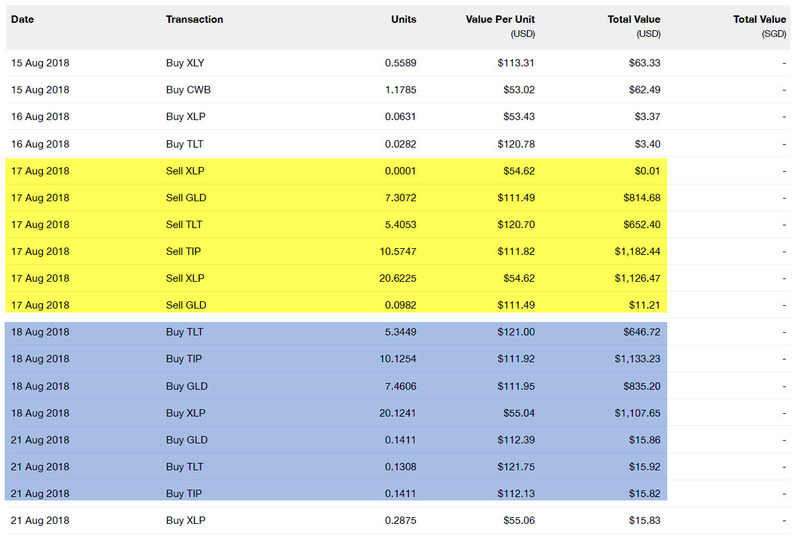 As a result, CDL should be trading > PB 1 and it can be deemed as undervalued if it is below its NAV or < PB 1. 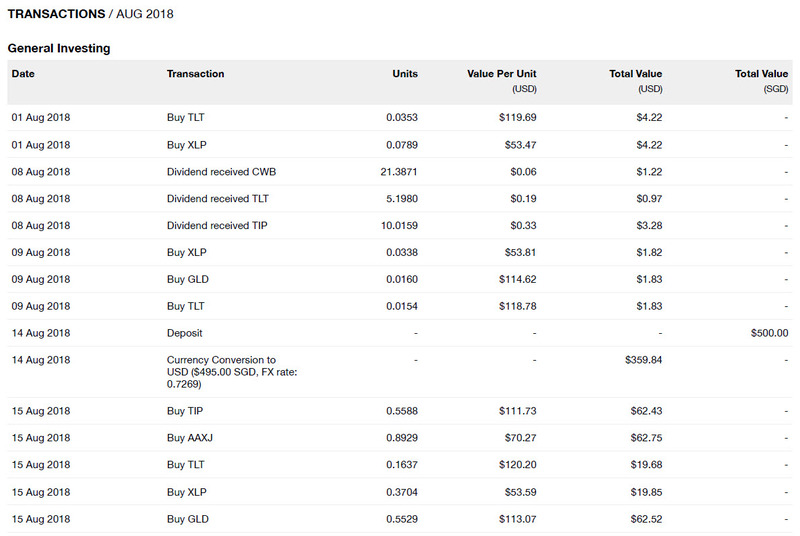 In addition, CDL has started share buy-back in the last week. We bought 1,000 units of Lion-Philip S-REIT ETF as part of our new strategy - New Singapore Budget, New REIT Strategy!